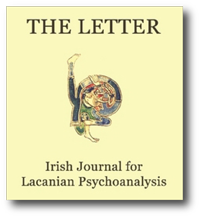 This issue of The Letter opens with a psychoanalytic discussion of ‘case presentations’ in psychiatric hospitals and elsewhere. Where Kraepelin tended to treat his patients as objects when presenting them to his students, Cormac Gallagher argues for the particularity of the patient as subject by applying Lacan’s formulae of sexuation to the clinic. He is critical of clinical vignettes being used in teaching, but he does see a place for the case presentation in the formation of psychoanalysts and he contends that Lacan’s ‘re-presentations’ at Sainte-Anne demonstrated the primacy of ‘saying’ over ‘the said’. While the case presentation from Emil Kraepelin onwards has tended to obectify and medicalise the psychiatric patient, this paper argues that it was in his re-presentations at L’hôpital Sainte-Anne that Jacques Lacan best demonstrated the primacy of “saying” over “the said”. And Guy Le Gaufey’s rigorous critique of the formulae of sexuation is thought to offer a basis for the essential integration of the “notall” into the clinic and for situating the particularity of the patient in the transmission of psycho-analysis. “Charcot‟s lectures … produced their effect primarily by their constant reference to the patients who were being demonstrated…. I sometimes come out, as from out of Nôtre-Dame, with an entirely new idea of perfection” (Sigmund Freud)…. This essay was to have served as a preface to Philosophy in the Boudoir.2 It appeared in the review Critique (191, April, 1963) in the manner of a review of the edition of the works of Sade for which it was destined: Éd. du Cercle du livre précieux, 1963, 15 vol. This scholion accompanies Lacan’s 1962 text in which he brings together of two very unlikely accomplices, Kant and Sade, and thereby sheds light on the nature of perversion. At first blush the two thinkers appear not to be drinking from the same well, but the author’s traversing the intricacies of thought wrought by Lacan in relation to The Critique of Practical Reason and Philosophy in the Bedroom provides the insight that the perverse phantasy of Sade has its basis in the universal maxim of Kant. Jouissance is said to be on the side of perpetrator and victim, although it is experienced in different trajectories. The author concludes with Lacan that Sade was not a true pervert, despite popular views to the contrary….. In Seminar VII, Lacan makes the claim that Saint Paul and Freud tell us the same thing about the Sovereign Good in that what they each articulate about the law and pleasure constitutes a denial of the notion posited in traditional ethics that a relationship of complementarity exists between pleasure and this Sovereign Good. The author demonstrates that that this denial corresponds with Lacan’s own thesis in the seminar, which involves the idea that the moral law affirms itself in opposition to pleasure, and Lacan’s critique of such a relationship is presented in terms of the moral tradition failing to recognise the nature of the object upon which pleasure truly depends….